Pixar’s new movie The Good Dinosaur takes place in a bizarre alternate history—what if the dinosaurs weren’t wiped out 65 million years ago? But the process of making this wild, ambitious film required a very different counterfactual: What if the way animators create scenery and characters had been turned on its head? Even for a studio known for taking risks and breaking new ground, The Good Dinosaur is an odd duck. And the more you learn about it, the stranger it appears. We spent a day and a half at Pixar’s campus in Emeryville, CA with a group of other reporters from online outlets, and we saw a big chunk of the film. And director Peter Sohn and his whole crew explained to us how they threw out the rulebook to make The Good Dinosaur, and basically came up with a whole different way of creating a world. We had already seen a lot of footage from The Good Dinosaur at Disney’s D23 event back in August. But the half hour or so that we saw last week was the biggest sizzle-reel that anybody outside Pixar has seen. And it had the final music, sound and other effects, which made a big difference. And in answer to your first question, yes, The Good Dinosaur will make you cry. In a nutshell, we learned that Arlo, an apatosaurus, lives on a farm with his parents and two siblings, where Arlo has a hard time fitting in with the rest of the family. But then Arlo’s father is killed, and soon afterwards, Arlo himself falls into a swift river and is carried hundreds of miles away from home, in a crazy kinetic sequence that conveys the feeling of not knowing which way is up. Arlo winds up in a strange landscape, where he struggles to climb and get food despite his lack of opposable digits—there is a lot of four-legged slapstick in this film—and then he meets a human boy, who brings him food and seems friendly. The human boy has basically the intelligence of a smart dog, and can’t speak, unlike Arlo. And Arlo has no interest in acquiring a human pet, so he keeps trying to shoo this unruly beast. But the boy keeps coming back, and turns out to be incredibly useful to Arlo (because hey, opposable digits. And climbing.) When another dinosaur, a styracosaurus who collects other creatures as symbiotic pets, tries to claim the human, Arlo fights to keep him. And whoever names the boy gets to keep him, so Arlo finally gives him a name he’ll answer to: Spot. Then Arlo and Spot bond over their shared sense of loss—Spot has lost his entire family. Spot howls at the moon in sorrow, and Arlo finally joins in. There are also some pretty hilarious sequences where Arlo and Spot mess with some irate gophers who keep getting pushed out whenever Arlo and Spot blow into their holes. And Arlo and Spot catch fireflies, too. We also saw a huge chunk of a sequence where Arlo and Spot team up with a family of T-rexes, who are basically cattle ranchers and act like cowboys. The T-rexes have lost their herd of buffalo, and they enlist Arlo’s help to track them down and then flush out the cattle thieves who stole them. The cattle thieves turn out to be a gang of raptors, who are the only feathered dinosaurs in the movie and are designed to look sort of like they’ve got mullets. They’re uncouth and vicious, but ultimately no match for the T-Rexes. Then Arlo and Spot sit around the campfire with the victorious T-Rexes and they share stories. The footage was pretty exciting and wild, but it also showcased the movie’s main strength: the beautifully rendered landscape, which almost looked photorealistic. 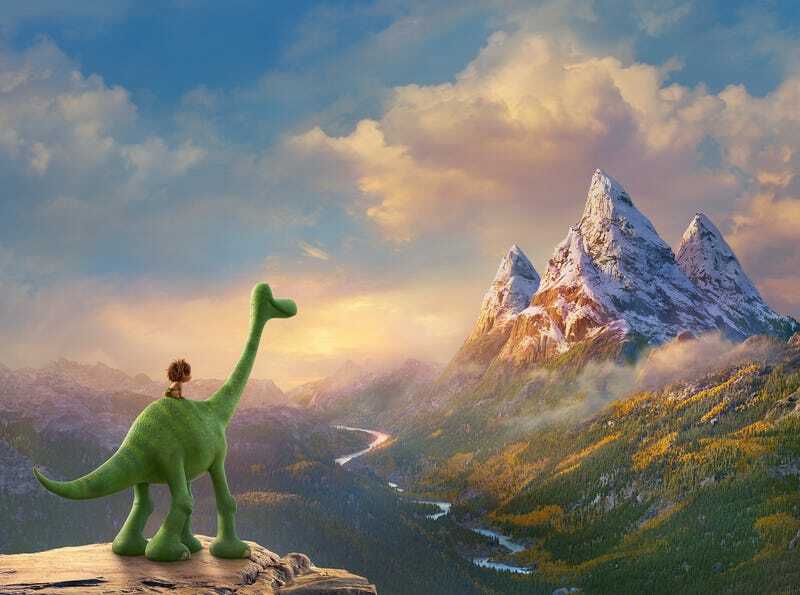 The landscape is one of the main characters in The Good Dinosaur, the film’s creators explained, including that river that sweeps Arlo away. The wilderness is one of Arlo’s main antagonists, but it’s also something he has to learn to make peace with. And that river changes to reflect his circumstances and his relationship with Spot: When Arlo and Spot are fighting, the river is choppy and turbulent, but when they’ve become friends, the river becomes more placid, almost like glass. The makers of The Good Dinosaur made a few research trips to Wyoming and Montana to try and get the landscape right in the film, and they spent a whole evening telling us about their research. Including a trip whitewater rafting up the Snake River where they lost their GoPro in the water—only to retrieve it later, full of footage of getting swept away that proved invaluable. But in the process of learning about the wilderness of the old West, Sohn and his crew also learned more about the people who lived there, and this led to the film’s characterizations being less stereotypical. Take those T-rexes: Originally they were much more like stock cowboy characters from old Western movies, but after Sohn spent time with real-life ranchers, he could no longer depict the dinosaur cattle ranchers in such simplistic terms. The next day, we spent hours listening to the makers of the film describe their process—and the main elements that required a lot of inventiveness seemed to be 1) creating believable dinosaur characters, particularly Arlo, and 2) bringing that landscape to life. And the landscape, in particular, posed a huge challenge. As David Munier, the film’s sets supervisor, explained, previous Pixar films might have one big “establishing shot” of the landscape at the beginning. In Brave, you get one big shot flying over the mountains, and the rest of the film is set inside the castle or in the woods, and we never see those mountains again. This initial shot of the mountains is a “specialty shot,” that requires special computer modeling to create the mountains and then add details to it, a time-consuming process that takes months. In the end, the film is basically set at the base of the Grand Tetons, except that the designers added one fictional landmark: the Clawtooth Mountains, near where Arlo’s family lives. These are the only mountains with snow on their peaks, and they’re where Arlo is trying to get back to, so it was important for them to be easily recognized. Once they had this method, they could go “location scouting” using Google Earth—in one case, when Arlo is trapped in a canyon, they found that location in Idaho, and then added more rocks so Arlo couldn’t just get out the easy way. On top of that, Munier needed to be able to put realistic clouds over this metafictional landscape. And here, too, his team came up with a very different way of doing it—instead of painting the clouds in, they used the volumetric effects software that was designed to create storms to “compose 3D clouds in the sky.” The clouds needed to be lightable, just like the landscape, and this method meant that the lighting department had 100 percent control over everything in the shots, from the clouds to the mountains. The final result is not quite photorealistic—if you look at the computer-generated landscape and a real photo side by side, you’ll see the differences. “We tried to put in just enough detail,” said Munier. But the background looks as detailed as the foreground, and there’s enough detail so the world feels like it’s full of dangers as Arlo travels through it. They kept adding more and more detail, until they worried about overdoing it, then pulled back a bit. The realism in the movie is more of a “painterly realism” than photorealism, added Director of Photography Sharon Calahan. You can’t actually see all of the leaves on a tree, but you know it’s a tree. “We’re often asked why we put highly stylized characters in a very realistic world,” said Calahan. When you look at Arlo, he’s incredibly cartoony and simple, and yet he’s standing in a landscape that looks amazingly detailed and real. This was a deliberate choice, said Calahan—they didn’t want overly realistic-looking characters, but they wanted a world with “scale and realism.” And they wanted something that looked real enough that the audience believed that Arlo was really drowning in cold water and that the rock he hits his head on is hard. The simple design of Arlo helps his green body pop out from the green foliage he’s standing in front of. “I actually love the way our simplified characters look in that detailed environment,” said Production Designer Harley Jessup. If you compare their “sets” in the film to actual photographs, you can see how they simplified the landscape down to its basic elements and removed the chaos of nature, Jessup added. “We needed to think differently about how we created the scope of the world, so we could free the camera to move around in it,” Calahan told us. Normally, for each landscape shot, they would have done matte painting followed by “foreground tests,” but there wasn’t enough time to do that for this many shots. So the USGS data was a huge blessing. They could do a partial version of a set, adding elements like trees and rocks, and then do lighting tests and start rearranging the elements to get the “painterly look,” before finishing it up. With every shot, Calahan said, she was thinking about “ways to instill a little bit more visual poetry into the film.” She wanted the colors and the lighting to sell the mood of each sequence. Like, Arlo’s last scene at home before he’s swept away is melancholy and conveys a sense of the “golden hour,” but then when he’s swept into the river, it’s as cruel and cold-looking as possible. When he finds himself in a strange landscape the next day, the colors are neutral and uncertain, and the clouds are moving quickly. Calahan wanted there to be deep contrasts of color, from scene to scene. In addition to using the USGS data for the landscapes, they needed to be able to capture the feeling of the rushing waters on the river, because that’s such a major element in the film, said Jessup. “That river is the visual spine of the movie,” added Jessup—it’s the Yellow Brick Road that Arlo follows to get home. So that whitewater rafting trip was a huge help in getting realistic water footage to draw on. There are approximately 200 shots of the river in the film, and they needed to be able to show it in all kinds of states of activity, said Reisch. In Brave, there was just one river sequence, and this movie required tons of river shots—so in the end, they created eight segments of river that they could plunk down in any sequence as needed, like LEGO blocks. There are about 400 shots of rain in The Good Dinosaur, which was another huge challenge to animate. Overall, there are 900 effects shots in the film, twice as many as any other Pixar film. Also, the film-makers spent a lot of time trying to imagine how the dinosaurs could have built cabins and other structures without the use of hands, because they wanted to avoid a Flintstones kind of feeling to the world, said Jessup. Everything is crudely put together, but the dinosaurs have enough power to dig and move rocks and trees around easily. The other major challenge in the film was creating dinosaurs and other characters who looked believable, but also were something the audience could invest in. According to animators Kevin O’Hara and Rob Thompson, they went to the zoo to observe elephants, to see how they moved. “One of the scariest things to animate is a quadriped, because there are a lot of moving parts,” said O’Hara. So they came up with a system where when Arlo’s hips go up, his head also goes up and his chest goes down. For the T-rexes, they had to look sort of like cowboys riding on horses, so the animators gave them the motion like the rear legs of the horse, and then the “rider” is the top half of the T-rex. According to Jessup, Matt Nolte did a series of “character studies” for all the major characters, to see how they might look in different poses—like what does Spot look like when he’s running, for example? “Spot was one of the hardest characters to do,” said Jessup. He has to be able to run like a dog on all fours, and sit like a dog as well, but be a human boy. To get an idea of the scale of Arlo, they created a full-size model of his head. And then Sohn asked if they could create a complete full-size Arlo, all 18 feet tall. They did it, out of cards and foam core. The whole crew went outside and took photographs of the massive Arlo statue, which we sadly didn’t get to see in person. Above: Set design by Noah Klocek and Philip Metschan. The Good Dinosaur comes out on November 25. Correction: An earlier version of this article mentioned the U.S. Geographical Survey instead of the U.S. Geological Survey.